Photographs shot on site are turned into 3D scans via photogrammetry, a process whereby a series of still photos of a scene can be assembled by software into a three-dimensional scan. With further editing in 3D modeling software, the scans become the basis for painted sculptures made with digital fabrication technologies such as CNC routers or 3D printers. Shown below are sculptures and source photos from which the 3D files were made. YouTube video showing the process of making the "Bird" Ventifact sculpture. "Canada Glacier from Lake Fryxell"
Site photographed for the sculpture is on the left side in this photo, centered over the lake. "The Road to the Double Curtain Glacier" and "Walking on Sea Ice"
in Downtown LA (one shown center)..
Background: My interest in digital 3D technology grew out of an ambition to convey the idea of the natural world as a dynamic system, where any given form in nature is a product of the complex physical forces at work in the particular conditions of the moment. In 2007 I approached a 3D imaging firm and we embarked on an experiment to see if we could translate one of my photographs of clouds into a relief sculpture. The sculpture, titled Rise, began with a high-resolution digital photograph of a cloud formation, with tonal adjustments to bring out maximum detail. I directed a technician as he created a digital 3D file from the 2D image. A virtual sculpture took shape on the screen, in a process that resembles inflating and deflating the form. The resulting 3D file was sent to a prototyping firm, where it was milled in polystyrene foam on a CNC router. A mold was made from the foam model and it was cast in polymer-modified gypsum and painted. But it was expensive to produce and the computing power and technical barriers to working on my own files caused me to set the idea aside and focus on photographic prints. The field of digitally aided 3D design evolved to the point where I felt that I could resume my photo-into-sculpture explorations in 2013. A new technology called photogrammetry became available, enabling me to translate a series of still photographs directly into 3D files, without the guesswork involved in producing Rise. I have gained proficiency in the use of photogrammetry and 3D editing software, and joined a community digital fabrication facility where I have access to CNC routers and 3D printers. 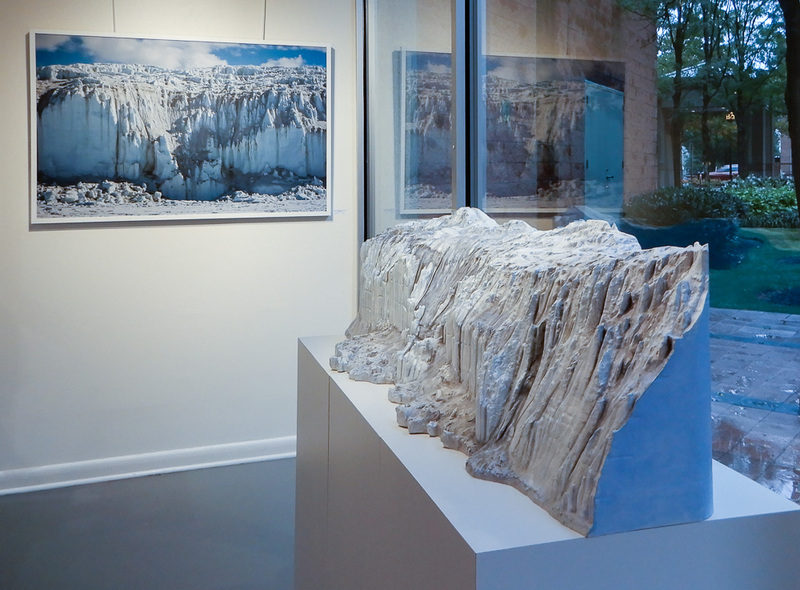 After much perseverance in working out technical issues, I have developed a workflow to translate my photographs into sculpture of increasingly large and complex landscape forms, to the point where I have recreated features such as the side of a massive glacier or the complex surface of a wind-eroded boulder, and created the first works based on photogrammetry in the over 30 years of the National Science Foundation Antarctic Artists and Writers Program. I am continually building my skills in 3D modeling and streamlining the process of translating the raw photogrammetry files into compelling works of art.